Large collection of great Title & Text overlays. Animated opener, Lower thirds, Subtitles, End Credit and more. Experts say that Vegas Pro cannot be considered as a good option for beginners as they will not be able to access this advanced interface so easily. It is even difficult to use simple features like text insertion over Vegas Pro. 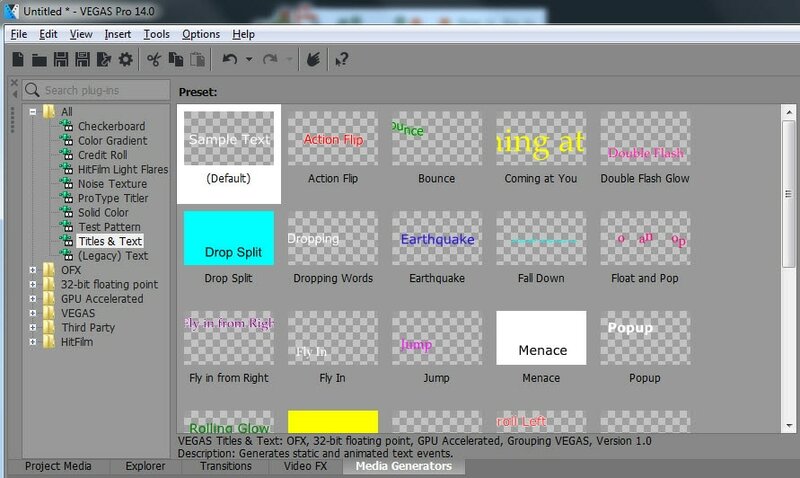 If you are finding some difficulties in using Vegas Pro Text adjustments then following details can help you to create a unique project. The tutorial below provides complete information about how to change positions of title, text freely, use fading effect and set color or transitions of text over images or videos. There is no doubt to say that Vegas Pro is a professional video editing tool, and the sad part is that it is complicated and the advanced user interface appears difficult for beginners. Secondly, this tool works only on Windows environment and you need to pay $599 for its complete access on your personal device. With all such problems, it cannot be recommended as a beginner specific tool; experts prefer to suggest Wondershare Filmora as most useful editing platform for beginners as well as professionals that are working on Windows and Mac. The powerful tools and easy to use software interface of Filmora is advantageous over Vegas pro. The trial version can be downloaded for free by anyone but for licensed version you need to make small payment. Beginners can take lots of benefits from Filmora as it works perfectly on Mac as well as Windows and has direct interface with social media websites. Same as Vegas Pro, it extends support to almost all popular video file formats. Just go to Media Generators Tab and then select Text and Title. You will find several present type text effects like Action Flip, Bounce, Float and Pop etc. Pick any of these that you find suitable for your project type. Once you have made selection then drag it to your timeline and make sure goes on a new track on TOP of the existing video. This is an important selection step that will make all decisions about how your added text will appear in final project. Simply go to Generated Media icon, click over it and a pop window will soon appear on screen. Go to Duration option on screen and enter your desired time period on available slot. It is also possible to increment or decrement this duration directly with the help of trim handle. The screen shows easy size and font selection options where you can choose italic appearance as well as bold option for your text. Many font types are available with classic appearance. The Text color option help users to choose any desired color from a set of colors. There are two bars on screen where left one help to make settings for color temperature of text whereas eight one can be used for adjustment of text transparency. Scaling: It determines the overall variation to zooming effect. Location: Users can directly move text box to any desired location over video file as per need. Tracking: This setting helps to set distance between letters on text box. It is also possible to set fading of text on video file as users may need to set it to different levels as per type of project. The fade in and out option is available on timeline exactly above the text where you can use the slider to make all adjustments.